It took him a bit longer than expected, sitting on 2,998 hits for seven straight games, but Ichiro Suzuki finally tallied his 2,999 hit on Saturday and promptly recorded knock number 3,000 on Sunday, making him the 30th player all-time to reach the incredible mark. With the hit, Ichiro has all but locks himself in as a first-ballot Hall of Famer. Although Ichiro’s batting average for this season has taken a bit of a dive recently, due to his several hitless games in a row, he’s still batting .317 on the season and holds a .314 lifetime average. It’s that type of consistency that has ultimately given Ichiro so much success over his career. Spending most of his “prime” years over in Japan before coming to the United States in 2001, Ichiro absolutely burst onto the scene, hitting .350 with 56 stolen bases his rookie year. That would turn out to be just the beginning of what would turn into ten straight 200-hit seasons and subsequently 3,000 hits. Whether Ichiro retires in the next year or two, or decides to play until age fifty is yet to be seen. But one thing is for sure. As long as Ichiro continues to don a uniform, he’ll continue to do what he does best: Get hits — lots of them. 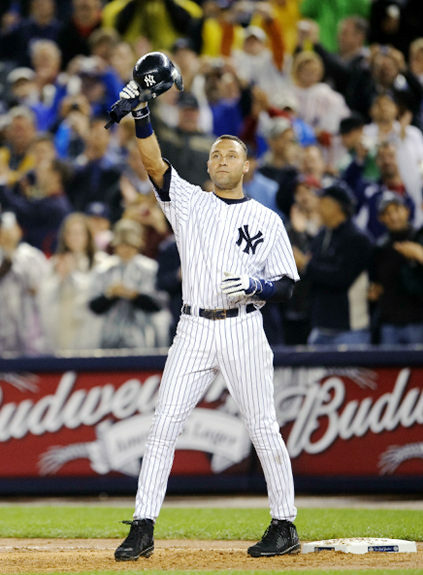 When Derek Jeter homered for his 3,000th career hit, the moment was magical. When Alex Rodriguez did the same on Friday night, the moment was controversial. The fans cheered, they acknowledged the historic moment, but there was a lingering feeling that things just weren’t the same. Although Rodriguez has played in 63 games since returning from a season long performance enhancing drug suspension in 2014, the air around A-Rod is still rather bad. The majority of baseball fans have vowed to never get over his PED use and don’t see the milestone as much to celebrate. While I agree to an extent, A-Rod’s 3,000th hit is still something to stop and think about for a moment. After all, only 28 other players in the history of Major League Baseball have ever recorded 3,000 or more hits in their careers — 28 out of over 18,000 players. In addition, Mike Schmidt and Derek Jeter are the only other players to record their 3,000th hits on a home run. So the hit by A-Rod shouldn’t be completely overlooked. But at the same time, the moment won’t ever be seen in the same light as it should have been if A-Rod had remained clean. Rodriguez is creeping up towards 700 home runs, and is one of only five players to record 3,000+ hits and 500+ homers, joining Hank Aaron, Willie Mays, Eddie Murray and Rafael Palmeiro. He’s one of the all-time greats. Rodriguez should be getting celebrations around baseball, but instead he’s getting booed by many of the fans everywhere he goes. And rightfully so. I don’t agree that a player who recorded 3,000 hits clean and one who used PED’s throughout their career should be looked at in the same light, even if it is a remarkably rare achievement. But, thankfully, it shouldn’t be too long before we get the chance to wholeheartedly celebrate a player reaching 3,000 career hits: Ichiro Suzuki, who is just 114 hits away. With a sharply hit ground ball that bounced its way into left field, Jose Altuve notched his name into the record books on Wednesday night, recording his 200th hit of the 2014 season. Just the second Astros player to ever reach that mark, and the first player in Major League Baseball to do so since 2009, Altuve is undeniably having a career season that many players only dream about. Altuve leads all of the majors in hits (27 more hits than the next closest player), batting average (.336) and multi hit games. In addition, with his 52nd stolen base on Wednesday, Altuve also leads the American League in steals, and joins a rather elite group of players to have recorded 200 or more hits to go along with 50 or more stolen bases in a season, with Jose Reyes being the last to accomplish that feat back in 2008. Although the Astros’ playoff drought continues, having not made the playoffs since 2005, Altuve has been one of the many bright spots on the team, with several players having standout years. While Altuve is having the best all around season of them all, players such as Chris Carter and George Springer are also having great years for the Astros, despite holding low batting averages. However, low batting average is a major issue with the entire Astros team, with only two other players besides Altuve batting over .250 on the season. That’s something that will need to be addressed for next year, but with this being the first year since 2010 that the Astros are going to finish with a record of fewer than 100 losses, things are definitely moving in the right direction. While I don’t see a playoff push anytime soon for the Astros — playing in the difficult American League west division that includes a good Mariners, Angels, Athletics, and Rangers team (once they return to full health) — they could definitely make things interesting next season. With their offense clicking fairly efficiently, and their pitching doing terrific (Astros starters are now 6-0 with a 1.95 ERA in the team’s past 10 games), the Astros are certainly a team to watch. Having won eight of their last ten games, over which Altuve has recorded 16 hits to make for a .390 average, the Astros are giving their fans something to get excited about for the first time in quite awhile. With Jose Altuve approaching the Astros’ all-time hit leader for a season, Craig Biggio, who recorded 210 hits in 1998, Astros fans should be excited about where this team is headed. Though they may not be raising a World Series trophy anytime soon, they’re slowly but surely finding a way to win games against good teams. That’s something to look forward to seeing more and more as the seasons go on, with Jose Altuve leading the way. Brett Gardner is the batter—a fun guy to watch. He can hit. Has great speed. Normally the guy in which all of the attention would be on at the moment. But today is not a normal day. Even with Gardner the batter, the crowd can’t take their eyes off of Jeter, who stands in the on deck circle. Cameras in hand, ready to capture that milestone moment of 3,000 hits, the crowd waits in anticipation for Jeter to step to the plate. For with one swing of the bat, history could be made. The wait is nearly unbearable. You can almost feel the crowd wanting Gardner to hurry and get a hit, or worse, an out, just to bring Derek to the plate faster. The crowd soon gets their wish, as Gardner grounds out to second. 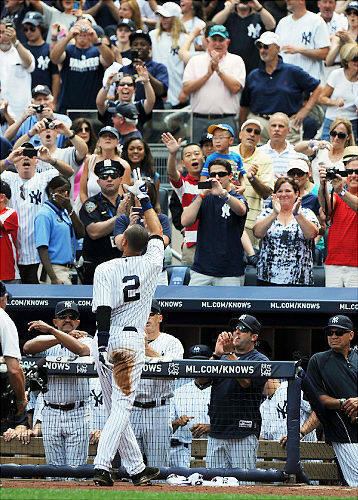 Finally, the moment the crowd, and Jeter, have been anticipating for months, is now folding out in front of their eyes. As Jeter rounds the bases, with that patented Jeter grin, his fellow Yankees begin to clear the bench. By the time Jeter rounds third, all of his teamates are waiting to give their congratulations. After all, Jeter just became the first Yankee to ever get 3,000 hits. Something well worth congratulating. You could tell Jeter wanted to remember and cherrish every second of what was going on, as he hugged ever member of the Yankee team. The crowd meanwhile, is going crazy. An impressive site to watch. Derek Jeter would go on to record three more hits, going 5-5 on the day. I don’t think James Cameron could have written a happier ending to Jeter’s hard work. Afterall, this is something Jeter has been working towards his entire career. So, to do it with a home run, is almost a dreamlike outcome. But no need to pinch yourself, this dream is a reality. 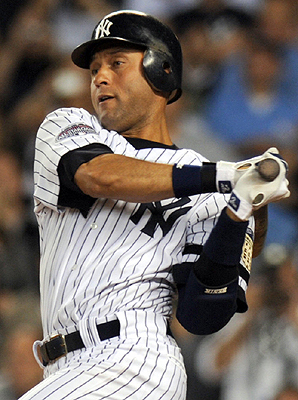 Derek Jeter is one of the classiest players in baseball as well as one of the best players to ever wear the pinstripes. El Capitan. Mr November. Captian Clutch. Derek Jeter. Many names for one great man. Derek Jeter. I tip my cap to you. Would you give it back? Sell it? Trade it for some nice goodies? What? Let me know what you would do, by leaving a comment. I want to hear your thoughts………. Jeter’s 3,000th Hit More Impresive Than His 2,722nd? Derek Jeter is on a seven game hitting streak. A streak that has helped to move him to 2,984 career hits. Just 16 hits away from 3,000 hits as a Yankee. No Yankee has ever done it. And I think it will be a while before any Yankee does it again. So is 3,000 more of a milestone than 2,722? Now that’s the first part of this enty. The second part deals with when Jeter will get it. This question is hard to predict. If Jeter keeps his streak up, he’ll get to 3,000 in exactly 16 more games. That would be June 19th, in Chicago versus the Cubs. But it is more likely that he’ll want to get it at home, in Yankee stadium. So the next available game at home would be June 24th versus the Rockies. But if Jeter starts getting like 2 hits a game, he could get it in the last home series before leaving for a long stretch of road games. It all depends on if Jeter can keep the hit streak up. The only sure bet is that Derek will get hit number 3,000 sometime this month. So stay tuned to Jeter’s progress, and watch EVERY Yankees game when he gets closer. Hit number 3,000 is just around the corner…….